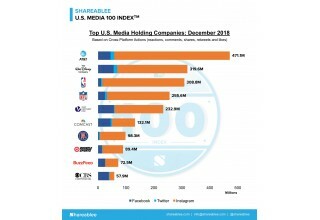 NEW YORK, January 9, 2019	(Newswire.com) - Shareablee Inc., the global leader in audience-based social media measurement, today announced that AT&T led the December 2018 U.S. Media 100 Index ranking of the most socially engaged media companies. 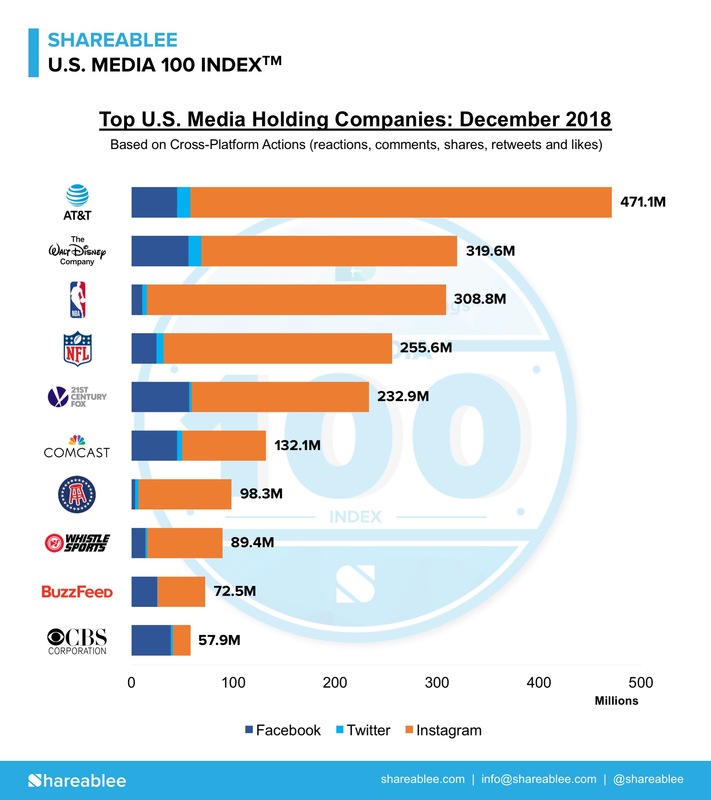 The Shareablee U.S. Media Index generated 3.2 billion cross-platform actions (post-level reactions, comments, shares, retweets, and likes) for Facebook, Instagram, and Twitter last month. Despite a 27.4 percent increase in engagement per post, overall engagement was down 9.37 percent as content fell 40.8 percent. 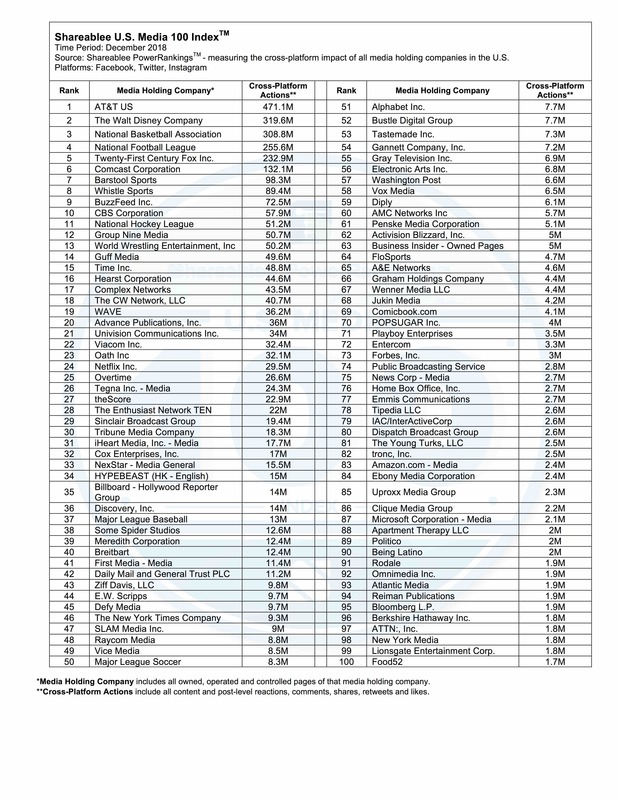 AT&T, driven by Warner Media, topped the ranking this December with 471.1 million cross-platform actions, followed by The Walt Disney Company (319.6 million actions), the NBA (308.8 million actions), the NFL (255.6 million actions), and 21st Century Fox (232.9 million actions). 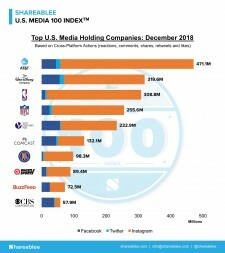 All of the Top 10 U.S. Media companies of the U.S. Media 100 Index decreased their cross-platform content in December vs. November, with an average of 39% decrease; with Buzzfeed having the smallest drop at a 20.9% decrease in December vs. in November. Buzzfeed led the video category last month with 1.3 billion views, followed by Disney’s 995 million views in second, Group Nine Media’s 744 million views in third, CBS’ 601 million views in fourth, and AT&T’s 599 million views in fifth. 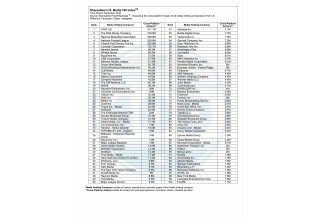 The top ten most engaged American media companies accounted for 63% percent of all actions across U.S. Media during December.